Social activist Medha Patkar has criticised the Madhya Pradesh government for invoking the National Security Act (NSA) at the same time when the Goods and Services Tax is all set to roll out. NSA will be invoked in the state from July 1 and so the new tax regime. According to Patkar, the move is an effort to stifle the Narmada Bachao Andolan. “I believe that the NSA is specifically to target the Narmada Bachao Andolan,” Patkar said. Earlier, the Madhya Pradesh government had issued a notification on June 19, stating that certain elements “threaten communal harmony and security of the state”. Sources say that the Act has been invoked to ensure the smooth roll out of the Goods and Services Tax, as it would help the government control agitation. Coming back to the Narmada Bachao movement, the Supreme Court has recently directed families affected by the project to vacate the area by July 31. At least 40,000 families fear submergence due to the latest plan to increase the dam height by 17 metres. Prime Minister Narendra Modi is likely to visit the dam site on July 15, the very day a relay fast by locals opposed to the dam, is set to complete a year. 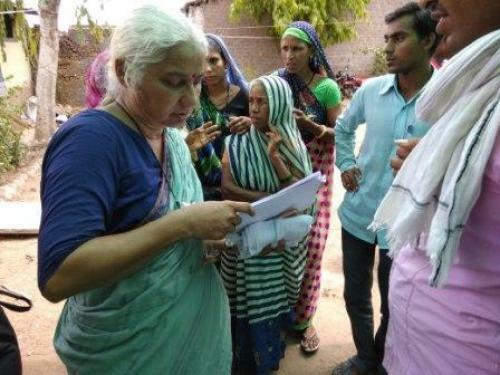 Patkar, who has been at the forefront of the Narmada Bachao Movement for 32 years, is still campaigning to stop the illegal eviction of families affected by the project. “There are tens of thousands of people still inhabiting the submergence zone as they have not got compensation or rehabilitation,” she added.